Thanks to ‘net metering’, grid-connected solar rooftop photovoltaic systems are gaining popularity among commercial and residential users, and power distribution companies (discoms) such as Reliance Infrastructure (RInfra) and Tata Power are making the most of it by helping them with the installation. Under the ‘net metering’ policy, if a consumer installs rooftop solar plant, his electricity meter is replaced by ‘net meter’ which can measure import and export of energy. Hence, there is no need to store the excess power generated in batteries or use it as soon as it is generated. The cost of buying batteries and replacing them every three to four years is also a burden. Installing a net meter allows users to export the excess energy to the grid and they have to pay only if their imports exceed exports. Both Tata Power and RInfra have dedicated teams to market rooftop solar to customers. At the moment, the focus is on roping in customers and sharing benefits of rooftop solar systems and net metering. The discoms have a presence in both Delhi and Mumbai but have received a better response from the former for grid-connected solar rooftop photovoltaic systems. “This phenomenon has picked up in Delhi in a big way as compared to Mumbai,” said an RInfra spokesperson. 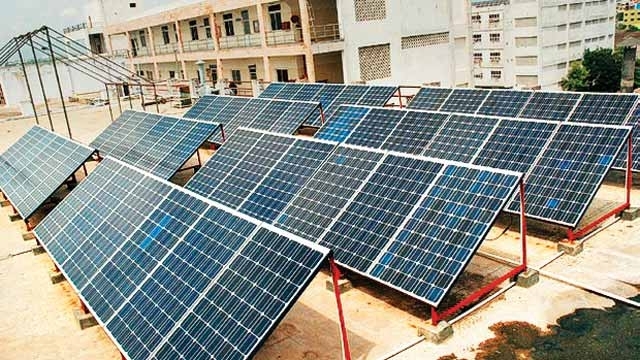 In Delhi, BSES discoms have energised 302 rooftop solar net metering connections, with an installed capacity of nearly 10 megawatt. “Another 104 applications with a capacity of 2.65 mw are under process. Consumers across categories, including leading educational institutions in Delhi, have warmed up to rooftop solar,” said the RInfra spokesperson. On the other hand, the discom has an installed capacity of just around one megawatt with 46 users in Mumbai. However, since the rollout of the ‘net metering’ policy in Mumbai, Tata Power has had only a handful of 30 consumers who have applied for those meters. Of these 30 consumers, eight have completed the installation and are connected to the grid under the net metering policy of Ministry of New and Renewable Energy. “In Mumbai, these consumers are installing solar plants where capacity varies from 5 kWp (kilowatt peak) to 700 kWp depending on their requirement and availability of space. Tata Power is also scanning for more opportunities in the future,” Shah said. The company did not share with DNA Money the total number of consumers who have installed net meters through Tata Power in Delhi. However, rooftop solar is gradually picking up in Mumbai in spite of space constraints as users across various categories of commercial, industrial and residential move towards self-sufficiency. RInfra has 70 applications are in pipeline. Presently, 14 gigawatt (gw) of solar projects are under development in India and around 6 gw are to be auctioned soon. During the year 2016, about 4 gw of solar capacity was added, taking the total of solar power generation to just over 9 gw. According to the estimates by Ministry of Power, another 8.8 gw capacity is likely to be added in 2017, including about 1.1 gw of rooftop solar installations. The Ministry of New and Renewable Energy (MNRE) has a target of 100 gw of power through solar energy by 2022, of which rooftop solar comprises 40 gw.